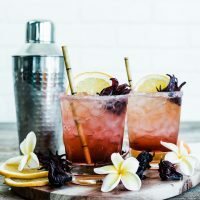 A delicious refreshing sparkling spiced cocktail with a tropical twist perfect for the holidays. 1. Combine the dried hibiscus flowers, sugar and water in a pan and heat on high stirring until the sugar is dissolved. 2.Bring to a boil, boil for 3 minutes then turn off the heat. Let cool completely. Strain into a glass jar then chill completely before using. The syrup can be made ahead of time. It can be stored in the refrigerator up to two weeks. 3. If using Hibiscus tea, steep the tea bags in the boiling sugar water. 1. Pour a little of the hibiscus syrup into a bowl and sugar in another bowl. Dip the rim of your glass into the syrup, let excess drip off then dip into the sugar, making sure to coat the whole rim. Set glasses aside. 2. In a cocktail shaker filled with ice add the rum, cointreau, orgeat and hibiscus syrup. Shake well. Add crushed ice to the glasses and divide the cocktail mixture between glasses. Top with spiced ginger beer. Garnish with orange slice and dehydrated hibiscus flower. ** You can find the Dried Sweetened Hibiscus Flowers at Trader Joes or online such as Amazon or other online specialty food shops. They might be seasonal at Trader Joes, so online might be your best bet during the holidays.